54Sport is an online trials bike and accessories specialist, created in early 2011 and based in the Sunny South east of the UK.Here at 54 Sport we aim to give you a top quality, personal service whether you are buying a top of the range bike or a tub of grease. 54 Sport have over 15 years of experience in the Trials world and aim to pass on our knowledge, experience and advice to all customers who use us. Thanks for visiting,have a good day! 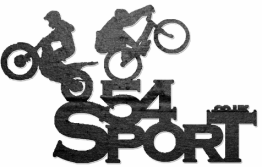 54 Sport is the creation of Scott Wilson, a Bike Trials rider from Kent in the south east of England. Scott has been involved in the trials world for over 15 years now and in this time has competed and performed shows all over the Uk and world. Present at National and world championship events for over 10 years, he has proudly reprented Great britian and all of his sponsors to 6 National titles, a european vice championship, and has had the honour of being crowned world champion. Scott has been involved in many other aspects of trials- shows, promotions, competition organisation and coaching. All of this experience helps scott to have a great knowledge of the trials world, a friendly relationship with riders and companys from all over the globe and have a huge passion for Bike trials. Scott has a big interest in all wheeled sports with or without engines- Mountainbiking, BMX, Motorcycle trials,Superbikes, Motogp, formula 1, so If you feel like distracting him for a few hours, just mention one of those and your away!